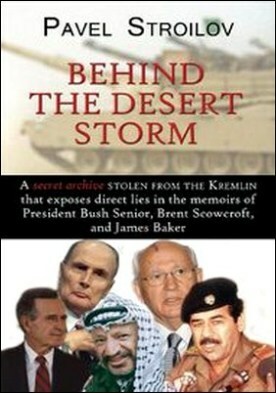 Using top secret documents stolen from Russian archives, historian Pavel Stroilov, a Russian dissident living in London in political exile, has written a masterpiece on the behind-the-scenes politicking of the first Gulf War that exposes direct lies in the memoirs of President Bush Senior, Brent Scowcroft and James Baker, and explains the truth behind the current revolutions throughout the Middle East. In addition to revealing a great number of never-before-seen top secret documents, Behind the Desert Storm delves into closed-doors discussions between world leaders – something that normally remains secret for a very long time. It tells the hidden history of the events which have largely determined the current state of the Middle East – from the conflict in Iraq to the Israeli-Palestinian ‘peace process’ to the development of the ‘Eurabia’ alliance between the EU and the Arab states. Looking forward, Stroilov draws out relevant lessons from history for future foreign policy.